As noted by Business Insider, celebrities including Alyssa Milano, Debra Messing and Justine Bateman are tweeting out support of the boycott scheduled for March 1. Publicized under the hashtag "#March1NRABoycott," Twitter users are urging followers to refrain from purchasing Apple or Amazon products, or shipping items via FedEx, as those companies are associated, however loosely, with the NRA. Apple currently hosts NRAtv as an Apple TV-only app available through the tvOS App Store, while Amazon makes the same product available through the FireTV platform as an Android app through the Amazon App Store. FedEx runs a discount program that affords NRA member an up to 26 percent discount on shipments. 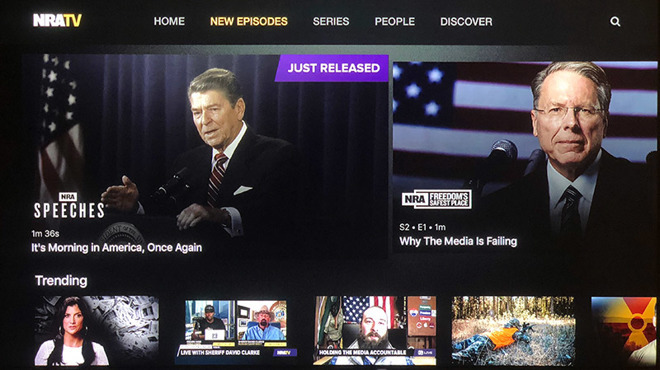 For tech companies, the NRAtv app provides streaming access to a 24-7 channel tailored to firearm enthusiasts, as well as a back catalog of content some argue heavily promotes far-right political ideologies. The group airs more than 30 original shows, including recordings of speeches and interviews featuring NRA executive vice president Wayne LaPierre, spokesperson Dana Loesch and other notable personalities. Seemingly sparking the Twitter campaign is a Change.org petition that calls on Amazon CEO Jeff Bezos to remove NRAtv from its streaming service and website. Created by Brad Chase, whose friend Daniel Reed is the father of a student who survived the Marjory Stoneman Douglas High School shooting, the petition acknowledges the NRA's first amendment rights, but takes issue with Amazon advertising the channel to its customers. Other efforts to strip NRAtv from streaming services include a bid from Mom's Demand Action, which seeks the channel's removal from Apple TV, Amazon FireTV, Google Chromecast, DirecTV and Roku, reports the Huffington Post. The NRA also distributes six apps through Apple's App Store — mostly digital editions of its print magazines — though activists appear to be focused on the organization's TV channel. An outspoken proponent of firearm ownership rights, the NRA is facing heavy criticism in the wake of the Parkland shooting that killed 17 students earlier this month. Survivors of the attack are invigorating the anti-gun movement and have challenged lawmakers to enact strict protections, while at the same time calling on companies to drop dealings with the organization. Many large business have complied, as Best Western, Delta, First National Bank, Hertz, MetLife and United Airlines all discontinued perks previously offered to NRA members.